Are you looking to increase the traffic to your blog? It is the most common question among the bloggers these days. You need to get into action if you want your blog to be flooded with the visitors. Traffic can be of two types one is organic traffic and social media traffic. I personally prefer organic traffic over social media traffic. Organic traffic is better with sales and it results in better bounce rate. If you want instant traffic to your blog than social media traffic is your answer. It is normally used for events or news type of blog posts mostly. Besides the type of traffic, both are welcome when it comes. Everything depends on traffic, many of us having a hard time to get enough traffic to our blog. When there is no increase in traffic many bloggers lose hope and quit blogging. Here under this article, I would like to share some proven strategies to boost your blog’s readership and increase traffic to your blog. The increased traffic will directly lead to a rise in the potential customers, readership and sales. But traffic won’t get a good funnel to anything you purpose, your content should be a quality content and one more thing which really matters is that the way you write your blog post. For writing a better and engaging content you may need to check this out things that make your content more engaging and quality content. You should share your posts across all the social media platforms such as Twitter, Facebook, Instagram, Pinterest, StumbleUpon, Google+ etc. Doing it once wouldn’t be enough as it will not complete all the work. You should try to share it several times. The main reason behind this is that all your followers will not be online whenever you release a new post. You should post it several times to make sure that all your followers notice it. The main reason behind this is that all your followers will not be online whenever you release a new post. You should post it several times to make sure that all your followers notice it. One of the most famous social media community is Reddit but it is way more strict for any spammer or newbie. So read carefully about it before sharing otherwise, you will get an instant ban. You can even use the social media platforms to drive referral traffic to your blogs. One of the most promising and effective technique in SEO is using long tails keywords. Always add some long tail keywords consisting 3 or more words in your post. It generally leads to low competition and ranks your page easily around the long tail keywords. Always keep one thing in mind that the rankings are directly proportional to the traffic. You can see that keywords matter a lot in search engine optimization. The blog commenting help you gain lots of new visitors. It is a common form of link building, which can greatly benefit your blog. Always make sure that the comments you post are helpful and innovative. You should aware of the fact that the owner of the blog may delete your comment and ban you further for posting any comment in the future if you try to use their comment section as the main source to attract the visitors. You can try out some dofollow blog commenting, but getting no-follow blog comments will also be beneficial for your blog as it will drive traffic to your blog and you will get a backlink. The SEO techniques greatly affect the traffic in a blog and you need to make sure that you are using the right one (white-hat SEO). Keep in mind that the way of writing is not the only way to improve your blog’s ranking. Never go for traffic shortcuts, but you are free to fetch any traffic hacks. Always avoid black hat SEO tools, tips, and techniques. This will surely destroy your blog at the end. You should make some time to ensure that you are using best search engine optimization tactics. After making a focus keyword, you need to make sure that it is used properly. On-page and Off-page are both equally important. You should strongly focus on the quality of your content. It should be such that the readers find it useful. You have to write the informative articles and it will increase the chances of your followers to share your post on the social media websites. You can expect to have new readers if you regularly post high-quality posts on your blog. Nowadays video tutorials, tips and products reviews are getting more famous than contextual information. Content cannot be replaced but still, videos are getting quite famous for marketing. Q&A sites like Quora and Yahoo! Answers are also could be helpful to get traffic. You can search Q&A sites to find hot topics related to your blog niche by browsing your blog related categories. Later on, write an article related to that hot topic with a solution to that problem. Something like an alternative to it. Share your article on Q&A sites as a reply to that question. Later on, write an article related to that hot topic with a solution to that problem. Something like an alternative to it. Share your article on Q&A sites as a reply to that question. This hack will also increase your blog’s traffic. Facebook promote option is quite effective while promoting any events, posts or websites. The Facebook ad offers you regional promotion which can help your business grow. You can also target particular audiences like you can find famous Facebook pages in your niche and target their fans. One other trick marketers are using these days, they promote them with an attractive big image with CTA and redirect visitors to their newsletter page which will generate lots of subscribers instantly. Same promotion feature is now available on Twitter. Social Media promotion is always better for instant traffic to your posts or blogs. You need to follow these tips and it will surely increase traffic to your blog. You need to have patience and stick with these tips. By following this, you will get more organic and referral traffic which will result in an increase in your readership. Having a good traffic on your blog is all about the proper blogging and proper marketing. Thank you so much for always posting such helpful contents that not only help us to improve our ranking & traffic but it also inspires us to become like you, man. Much appreciated! It would be a proud feeling if you find it helpful. Keep visiting for more blogging tips. Splendid article and you mentioned some helpful and actionable traffic tips. 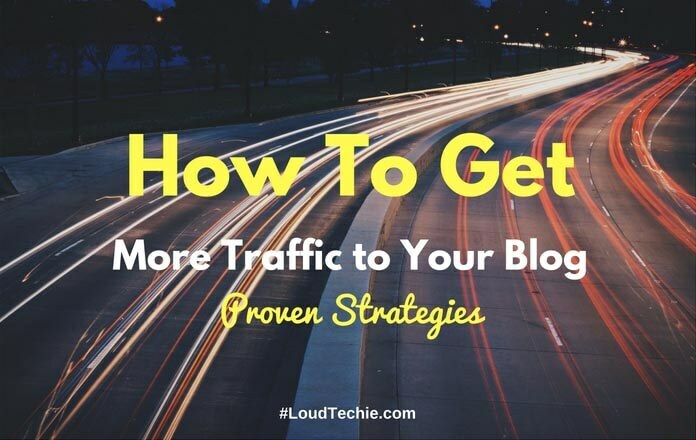 I hope this article will help every new blogger who is finding it difficult to get traffic. Thanks for your feedback. I tried to mention every possible way to get traffic to your blog. Nearly all the tips are self-tested before sharing it here. I just hope many new bloggers will grab these tips and do their best. Nice post 🙂 I found it really very helpful as per growing traffic to my own blog. Yes! all of these strategies are worth applying. Before publishing this post I have tested almost all of them and find it very helpful too. I’ll try and see what comes up. Thanks for sharing and keep up the great work. Hey Alok. I have been doing this but could not get the expected traffic. Kindly suggest me few back link sites or the sources of instant productive sites. Instant backlinks are not quality backlinks. A perfect outreach can only make it worth. Get your eyes on your competitors what are they doing to improve their business.